Isn’t it interesting that many qualities and characteristics we had as children are the same traits we have now as adults? When I was a kid I made crafty things like latch-hook and cross-stitch, read a lot, wrote stories and I liked cooking. As an adult, I’m still reading and writing stories, still enjoy cooking (even though I love a break from everyday family cooking!) and I sew quilts and clothes for my kids and dabble in paints. Some things never change! Miss Ten reread my favourite childhood book during the holidays, and it made me wonder why I loved it so much. 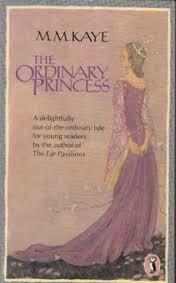 The book is The ordinary princess by M. M. Kaye, for 7-10 year-olds, most likely girls. It’s about a seventh-born princess who receives some beautiful gifts from her fairy godmothers on her christening day, such as charm, wit, grace and courage. But when the last godmother turns up, cranky and crusty, she grants the princess the gift of ordinariness. So Princess Amethyst becomes Amy, and as she grows up, no one wants to marry her. When Amy finds out her family are planning to lay waste a dragon in order for a prince to come and kill it to win her hand in marriage, she runs away to the forest and lives quite happily until she needs a new dress. She walks to a castle, finds work as a scullery maid, and plans to work there until she has enough money to buy a dress. But she meets a rather nice page, who turns out to be the prince of the castle. I will leave it to your imagination as to how the story ends! I loved that this story was divided into four sections, based on the lullaby, Lavender’s blue. The structure was so satisfying then, and I still appreciate a beautifully structured novel now. I loved the ‘realness’ of Amy and the contrast of the real characters against a little bit of magic. Amy was so grounded, the palace and forest worlds were well built, and I still like reading children’s fantasy novels. I thought that Amy was a heroine to be admired – she took matters into her own hands, was quite resilient and independent and could work hard. She was obviously a bit of a rebel – but in a very nice way! And even at 8, I loved the romance. My copy was published in 1980, and it has my maiden name written in roundish writing on the first page. The cover is lavender, with Amy staring dreamily into the distance. She wears a crown with amethysts and a long flowing dress with white cross stitches down the back. When I reread it this week, the words were so very familiar. Sometimes we try to encourage our kids to read widely and to read as many books as they can. We forget the joys of knowing a favourite book inside and out, of enjoying being with a wonderful character again, and even though we know how the story will end, appreciating different nuances of the story when reading for the second or third time. I wish I could go back in time and tell my eight-year-old self that reading would take me places and that one day I would write stories for eight-year-olds and adult stories that were based on fairytales. Kate Northrup wrote a blog piece this week called ‘We are who we always are.’ I’m still a little girl, reading and writing, making stuff. It makes me look at my kids with new eyes – what strengths and passions do they have now, and where will that take them? I’m feeling nostalgic! Let me know what your favourite childhood book was – and have you reread it as an adult or shared it with your kids? That sounds like a beautiful book Karen. I liked mysteries and adventures like the Famous Five, Nancy Drew and Trixie Belden but I am not sure I could reread them as probably a bit dated. One book I have reread is “My Family and other animals” by Gerald Durrell although not strictly a children’s books I read it in primary and it remains my favourite book of all time. I am almost not game to watch the TV series, The Durrells, as it may spoil the vision I have of the wonderfully eccentric characters and the beautiful island of Corfu where it is set. I loved Trixie Belden too, Leigh – she always seemed very brave and courageous to me! I haven’t heard of ‘The Durrells’ – don’t know whether to read it or watch it now! Karen, it’s amazing how you can’t recall what you had for lunch two days ago but remember fondly a favourite childhood book. Mine was “Little Women” by Louisa M Alcott. I loved/love ‘Little Women’ too, Wendy! I’m probably ready to read it again. I identified with Jo, because she was a writer! Mine were Charlie and the Chocolate factory or the BFG, both copies are worn and torn. I still reread some books. I call them ‘comfort books’ and read them when I am sad or stressed. Not because they are happy stories, but because the familiarity of them calms me. Yes, exactly. I reread familiar books because they are so familiar and soothe me. It’s like going back to a holiday place you have been to many times before and finding it is exactly the same! I loved ‘Anne of Green Gables’ as a kid and have enjoyed re-reading it lately with my 11 year old. Thank you for sharing this book, Karen, I think we will need to hunt it down. I loved ‘Anne of Green Gables’ too, Kris – one of my childhood favourites. Can’t wait for Miss 10 to start reading it!